Nasal polyps are growths that result from inflamed mucus membranes in the sinuses and nasal passages. They can extend to the opening of the nostrils, or even down to the throat area and can block the nasal passages. Nasal polyps are often related to other chronic diseases and tend to last for long periods of time. They can even grow back after medical treatments or surgical removal. Nasal polyps can occur along with many other respiratory diseases, such as allergic rhinitis, chronic sinusitis (due to bacterial and fungal infections), asthma, and aspirin allergy. It appears that nasal polyps are more common in people with non-allergic rhinitis and non-allergic asthma, rather than allergic types of these conditions. Nasal polyps can also be a sign of immunodeficiency diseases. For example, nasal polyps in children can be a sign of cystic fibrosis. Other immunodeficiencies, such as primary ciliary dyskinesia, Churg-Strauss syndrome, selective IgA deficiency, and common variable immunodeficiency (CVID), can be associated with nasal polyps, too. Overall, nasal polyps are relatively rare, occurring in only about 4% of the population. However, this number is significantly higher in people with other diseases, such as those listed above. However, facial pain is much more common in people with chronic sinusitis compared to those with nasal polyps. A person with severe nasal polyps may actually be able to see the polyps in their nostrils which look like clumps of clear Jello-O. Long-standing nasal polyps can lead to a widening of the nasal bridge, which can result in the eyes appearing to be farther apart. 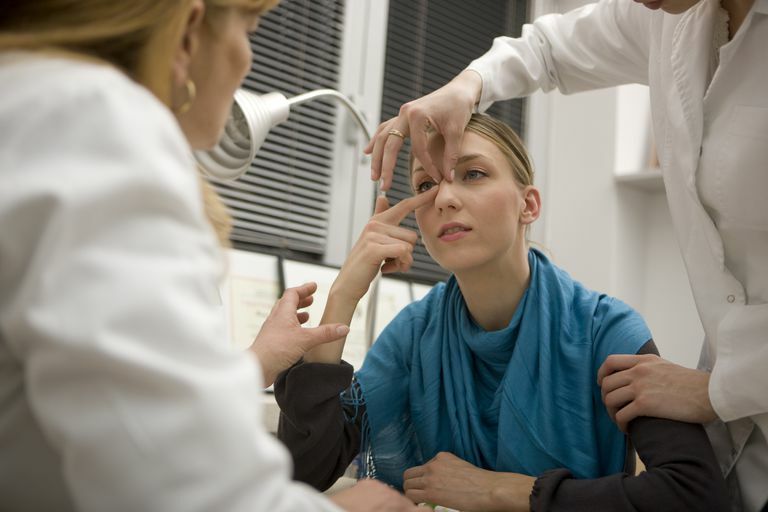 In some situations, a physician can make a nasal polyp diagnosis by examining the nasal passages. This may include nasal endoscopy, which entails placing a small camera into the nose to get a better look at the nasal passages. More commonly, however, a CT ("cat scan") of the sinuses is needed to make a diagnosis. Since other diseases are often present when a person has nasal polyps, further diagnostic tests may need to be performed. Nasal polyps may be treated by both surgical and medical therapies. In severe cases, sinus surgery is often required to remove the nasal polyps and any accompanying sinus infection. However, since nasal polyps tend to grow back in at least one-third of patients, the overuse of surgery should be avoided. The best therapy for nasal polyps usually involves the use of surgical therapies followed by medical therapies, as this approach helps reduce the chance that the polyps will grow back. Nasal Steroid Sprays and Drops: Topical nasal steroid sprays, such as Flonase (fluticasone propionate) and Nasonex (mometasone furoate), can help reduce the size of nasal polyps and prevent polyps from growing back after surgery. Some physicians use nasal steroid drops, rather than sprays, in order to better penetrate the nasal passages and reach the nasal polyps. Corticosteroids: Oral corticosteroids, such as prednisone, can quickly shrink the size of nasal polyps and are helpful in people with severe symptoms. After a short course of corticosteroids (about 1 to 2 weeks), however, topical nasal steroid sprays are able to control symptoms better and prevent the polyps from growing larger. In some cases, such as when fungal sinusitis is the cause of nasal polyps, low-dose oral corticosteroids may be required for weeks to months after surgery in order to prevent polyps from growing back. Antileukotriene Medications: Oral antileukotriene medications, such as Singulair (montelukast), are theoretically beneficial in people with nasal polyps especially those with an aspirin allergy. People with an aspirin allergy are known to have high levels of leukotrienes, so medications that block these chemicals should help to reduce symptoms of chronic sinus disease and polyp formation. Nasal Saline Irrigation: Nasal saline irrigation can be especially helpful in people with nasal polyps and chronic sinus infections. This is especially true for those who have had sinus surgery, as the saline can rinse out the sinuses and not just the nasal passages. Allergy Shots: Many allergists may use allergy shots in an attempt to treat or prevent nasal polyps from growing back after surgery. The best data for the use of allergy shots is in those with allergic fungal sinusitis; allergy shots may also prove to be helpful in those with nasal polyps and evidence of significant allergic triggers. Bachert C, van Cauwenberge P. Nasal Polyps and Sinusitis. In: Adkinson NF, Yunginger JW, Busse WW, et al, eds. Middleton’s Allergy, Principles and Practice. 6th ed. Philadelphia: Mosby;2003:1421-36. Pawankar R. Nasal Polyposis: An Update. Curr Opin Allergy Clin Immunol. 2003;3(1):1-6. Scadding GK. Comparison of Medical and Surgical Treatment of Nasal Polyposis. Current Allergy and Asthma Reports. 2002;2:494-9.